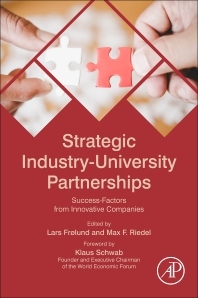 Strategic Industry-University Partnerships: Success-Factors from Innovative Companies unveils insights of experts from leading companies on managing partnerships with universities. Industry-university partnerships have proved vital to innovation, and although these partnerships can be challenging, careful choices and wise management around five success-factors leads to a systematic approach that unlocks value for both parties. University assessments of these partnerships have been widely described, but industry perspectives are less well understood. This volume captures observations of leading international corporations without omitting university views. It can serve all partners in alliances as a guide to strengthening their organizations. Dr. Lars Frølund is a visiting fellow and research director at MIT. In 2005, he established one of the first units for university-industry collaboration in Denmark. He has since worked intensively to develop strategic collaborations between research and private companies. Dr. Max Riedel is senior consultant at Siemens Corporate Technology University Relations. His daily tasks include consulting Siemens businesses in all aspects of university cooperation, ranging from developing a partnering strategy over finding suitable research partners to fostering long-term strategic cooperation. He is also key account manager for two of Siemens’ Strategic Partner Universities.